Many will remember the old Broadway Hotel that was torn down in 1982. It was 97 years old at the time and was owned by Jack Pepper. The Peppers ran a donut shop in the hotel. There have been several owners through the years, a few of the later owners were Ma Keck, or Glenn & Hattie Fletcher. 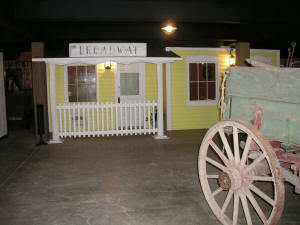 The construction of the Broadway Hotel was not one of the buildings planned in the first phase of the museum basement project "Old Leoti City-1887", that is until Tony and Darlene Harkness asked if the museum would be interested in some wood trusses that they had made several years earlier and then did not use. Tony, Darlene, Brian and Kyle & Heather Leimkuhler took them all apart, hauled them to the museum and even carried them down the basement steps. Boy, you can’t beat a deal like that! 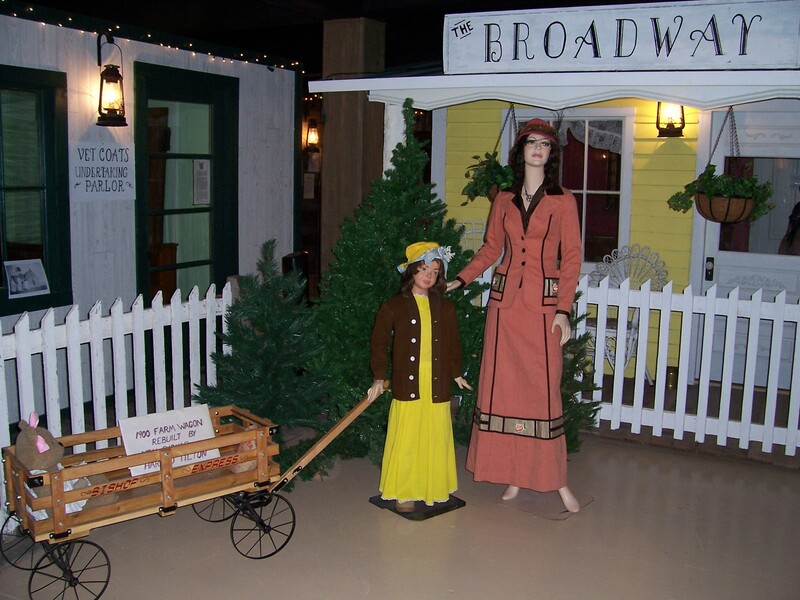 These 2X4’s were used to frame the Broadway Hotel and the Broadway Dining Room by Don and Jeanene French and Curt Walk. The interior walls were put up by Karen Walk and were made of masonite sheets from the Caprock/Cargill Grant. The lower portion of the north wall was covered with wainscot from the original Broadway Hotel, which Karen & Erd Mitchell put up. Many other architectural elements were also used, such as the doors, windows and door pediments. The pediments were hung over the windows and doors on both the interior and exterior. They looked pretty bad to start with, but Karen filled holes, sanded and painted these and then Erd helped hang these. The unique 8 foot tall doors were hung in the archway of the two rooms by Don. Another door was placed on the east wall with a sign, "Rooms Upstairs". It was great to be able to use some of the elements from the original building built in so early in the history of our county. 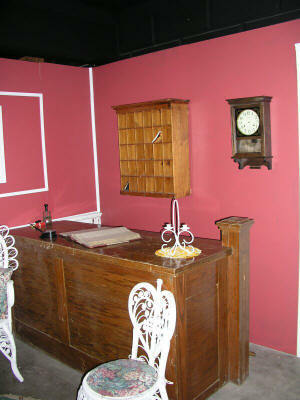 All of the inside woodwork was painted white, with a deep contrasting color of deep strawberry for the walls. The Western Hardware donated some extra cans of paint that were on hand, and we dumped some of them together and came up with a rather attractive reddish rose - strawberry color. Karen had salvaged a carved front panel from an old piano which she and Curt had taken apart about 10 years ago. She cut the panel in half, gave it a coat of white paint, and then hung two small candle sconces in the center of each of these pieces. They were then hung on the wall above the wainscot. They are a little different, probably none around like them! On the floor is a gray carpet donated by Lance Woodbury, also a small green oval rug donated by Loy & Anna Mae Oldham. The large desk came from the County Clerk’s Office and on the wall behind it hangs a pigeon-hole box which had been in the Ainsworth Post Office. This post office and general store was in the southwest part of Wichita County and Greeley County from 1887 to 1897. This store and post office was a little like Lydia, because it moved across the county line depending on who owned the store at the time. It had been put up into the Burch barn and remained there for many years. It was donated by Elaine Applegate. Recently, Ralph Fletcher, and his daughters, Cindy Toner and Karen Spicola donated a beautiful wooden telephone. It now hangs on the back wall beside the pigeon-hole box. This telephone belonged to Ralph’s parents, Glen and Hattie Fletcher, who ran the hotel for many years. This telephone had been their phone in the hotel. We were so happy to acquire this original historic artifact from the Broadway Hotel. Two antique white wicker chairs sit in the lobby area. These belonged to Curt and Karen Walk. Jeanene French placed one of her beautiful kerosene lamps on the desk, which is on a beautiful doily made by Esther Foushee. A desk bell sits at the edge of the desk for calling the hotel clerk. This had belonged to Gilles Neyer. Several old suitcases appear to be left at the bottom of the steps by a traveler that may have decided to eat in the dining room before taking his luggage upstairs. Looking through the window into the dining room you will see a beautiful blue-gray granite wood cook-stove which Hattie Gerstberger used for many years. This stove was donated by her son, Junior and his wife, Phyllis. It is in great condition. You can almost smell the food cooking, you can’t beat the food cooked on those old cast iron ranges. Just inside of the archway of the dining room sits a lovely wash stand. This is on loan by Kathryn and Matt Ford. To complete the "look", a matching bowl and pitcher are on the wash-stand for guests to freshen up a bit before eating. This set belonged to Ida and Louis Simons and donated by Jim Simons. The hand painted flowers on the set match perfectly with the color on the walls. The long table, which was donated by the SRS office when it closed up, is covered with a lovely damask tablecloth from the Parks Presbyterian Church. The table is set with dishes that are an heirloom Christmas set that had belonged to Karen Walk’s grandmother. The red stemware also belongs to Karen and the silverware was donated by Dale and Melba Hansen. Green wooden chairs at the table belonged to the Elmer Harkness family, which match a tall green dish cabinet which was donated by Dorothy Cooley. She also donated an arm chair with upholstered seat, which sits at the head of the table. On the wall hangs a large oval photo frame, which is covered with grapes, this was an original made by Margie Ames Taggert. The lovely hotel adds a spark of sunshine to our Old Leoti City, it is painted yellow with white trim. The porch out front adds to the Victorian ambiance of the late 19th century, especially with the pair of charming wicker chairs of Curt and Karen Walk. 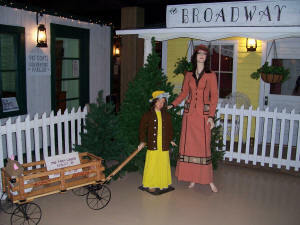 They are an invitation to the hotel guests to sit a spell and take in all of the busyness in the town square. All of the exterior wood for the hotel was donated by Doris Berry. It had also been a nice long fence in her yard, but I must say, it makes a better hotel than fence! The floor of the porch is now finished and it came from Doris’ daughter’s fence, who we all know as Susan Schrader. Rose Leisman donated the white picket fence. The fence, you may remember, was in front of Mrs. Johnson’s store and house. Rose purchased the buildings many years ago and it became the Fetty Carpenter Shop, next to the Western Hardware Store. This little store had been one of the original stores of Leoti and had been the Oyster Lunch Parlor, owned by Jacob Oyster. It was torn down a few years ago. Connie Mitchell painted the fence and it was dry just in time for the Grand Opening at fair time in 2004. We are going to miss Erd Mitchell, who did so much work on the hotel and in the basement in general. We appreciate all of his help and wish him and Connie the BEST!